One sign that spring has arrived is the appearance of fava beans at the market. 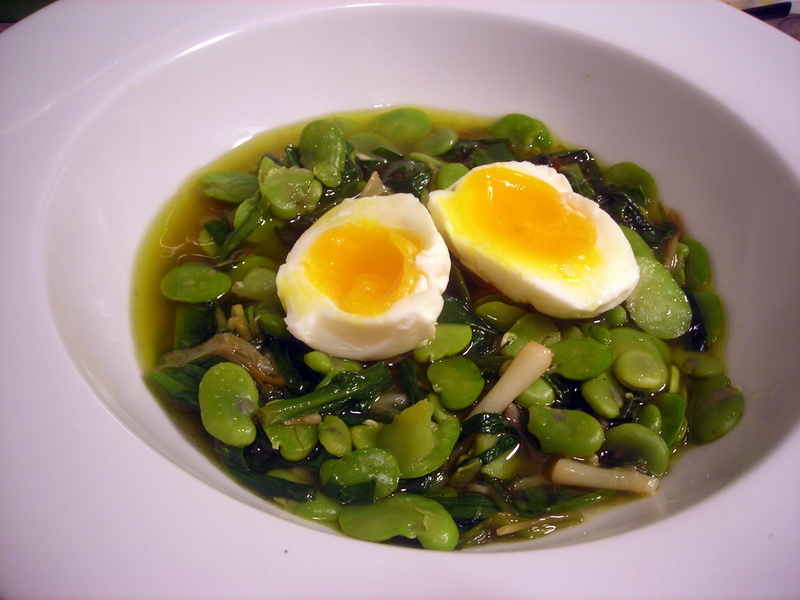 I love them cooked very simply in a bath of olive oil and water, and combined with ramps and soft-cooked farm egg. The intensity of the egg yolk and the lusciousness of the egg white marries with the beans and ramps to form a lovely vegetarian appetizer that’s reminiscent of the season. If you omit the egg, this dish becomes vegan. Shell the fava beans and discard the pods. Bring a pot of water to a boil, add the favas and simmer for 30 seconds to 1 minute. Drain, then shock the beans immediately in a bowl of ice water. The outer skin of each bean should come right off. Meanwhile, bring a pot of water to a roiling boil. Add egg and cook, about 3 to 5 minutes; cooking time will vary and is dependent on the freshness of the egg. Let cool, then peel and slice in half. Set aside while you proceed with the recipe. Put the fava beans and ramps in a saucepan with a mixture of half cold water and half olive oil, enough to barely cover them. Add the garlic and sage. Bring to a simmer, partially cover and cook until the vegetables are tender, about 3 to 4 minutes. When beans are done, taste for salt and pepper. Spoon bean mixture into a shallow soup bowl, finish with a squeeze of lemon juice, top with the soft-cooked egg halves, then serve at once. Time: About 1 hour, including prep. The vast majority of the time will be spent on shelling the fava beans. 05 Apr	This entry was published on April 5, 2012 at 4:54 pm. It’s filed under cooking, food, food photography, Gluten-Free, Italian food, recipe, spring, vegetarian and tagged appetizer, dinner, fava beans, food photography, gluten-free, ramps, vegetarian. Bookmark the permalink. Follow any comments here with the RSS feed for this post. i’m hungry just looking…where do you get your ramps? From Union Square Greenmarket. Rick Bishop of Mountain Sweet Berry sells them, as well as the folks from Berried Treasures. MSB has a booth there on Wednesdays and also on Saturdays. Thanks for stopping by, and for commenting. I picked those up at a local grocery store in my neighborhood. Fava greens are available at USGM. I don’t expect the beans until end of April or early May though. Are fava beans in the market already? The ramps were from USGM, the fava beans from a local grocery store in my neighborhood.